It is important to know your LVR (loan to value ratio) before you apply for any home loans. 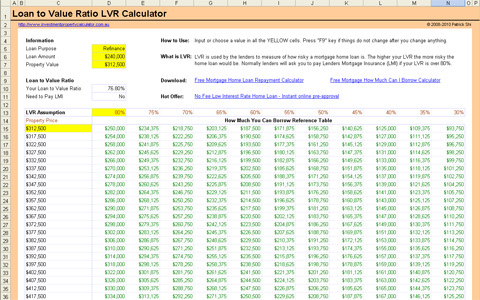 This LVR calculator calculates your LVR and whether you need to pay LMI (Lenders Mortgage Insurance). So what is loan to value ratio definition? The loan-to-value (LTV) ratio expresses the home loan amount of your mortgage as a percentage of the purchase price or the appraised value of your property. LVR is used by the lenders to measure if your home loan is risky. The higher your LVR is, the more risky your home loan would be. Normally lenders will ask you to pay Lenders Mortgage Insurance (LMI) if your LVR is over 80%. In short, the LVR determines if you can get the loan amount you want to borrow and whether you need to pay the LMI (Lenders Mortgage Insurance). Here is a screen shot that will give you a better idea that what you need to do and what this free loan to value ratio LVR calculator can tell you. 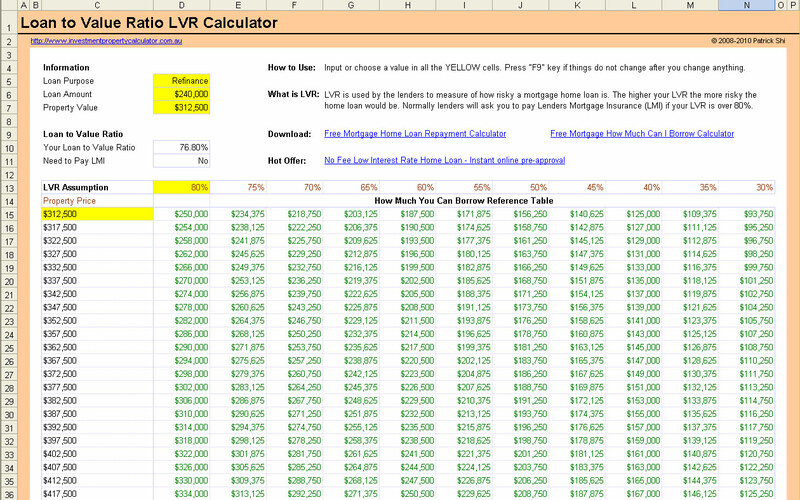 This LVR calculator also shows how much you can possibly borrow from the banks under different LVR and property price. However, if you want to estimate how much you can borrow more accurately, you should download the Free How Much Can I Borrow Calculator.